The gallery Marycharles born of love in life and commerce of the spouses Mary and Charles (hence the name). Born 50 years ago in the picturesque and charming Sorrento around the world known as "Land of the Sirens." At the center of this small town washed by the water, kissed by the sun, you can see the two exhibition spaces of Marycharles. The love of trade combined with the exquisite taste for the art of Marycharles allowed to use the best designers in the field of art objects made in Italy. 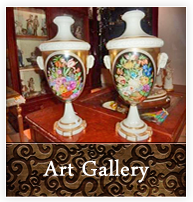 The finest porcelain, the most famous porcelain, bronzes, furniture, crystals are just some of the prestigious items that can be found in the tunnel. A pioneer in the introduction to Sorrento (1965) of the ceramics and the original and renowned Capodimonte, Marycharles has always offered its customers quality and exclusivity selected. The uniqueness of the exhibits and collections of rarities from the dawn have captured and captivated the interest of not only customers, but every day is the most diverse artists who, visiting the gallery, often come to court so that they be given Marycharles the opportunity to exhibit in the exhibition space their own personal creations. The repeated and constant visits of existing customers, then have the testimony of the professionalism and honesty profuse in relating with customers. In fact, the constant stream of visitors who at first is attracted by the elegance and originality of the tunnel is subsequently captured and spellbound by the courtesy and affability, which elements are considered of primary importance, capable of transforming a purely commercial relationship and strong friendship . In the tunnel between Marycharles valuable antiques, there are the superb ceramics Ceccarelli, the notorious Capodimonte porcelain, Fabris, Bennacchio, Pellati, Cazzola, the now rare Cacciapuoti, Cedraschi, Merli, the sublime hoods with its beautiful cherubs and his humor. Among the unique objects stand with old world charm bronzes result of the talent and hard manual work of a famous artist from Naples. In addition to the fine Murano glass, which is realized in the range of chandeliers and sumptuous figures of various kinds, Swarovski crystal with its lights and its iridescent is a gem of great value in the tunnel. Not least, the furniture of art ranging from ancient old before moving to modern, local and national production, all of unparalleled beauty and quality. This is only a taste of the fantastic wonders that you see in the Marycharles We are waiting for further details.